THE 1949 COLUMBIA FIVE-STAR SUPERB MOTOBIKE! Copyright (c) 1986, 1999, 2005, 2007, 2011, 2013 by NBHAA and Leon Dixon, All rights reserved. We are watching, so you watch your credit line! If you get information here- PLEASE SAY SO. Don't make it look like it came from you- or hey, everybody knows blah-blah. This article originally was written for the now-defunct CYCLIST magazine and appeared in the March, 1986 issue of that publication. 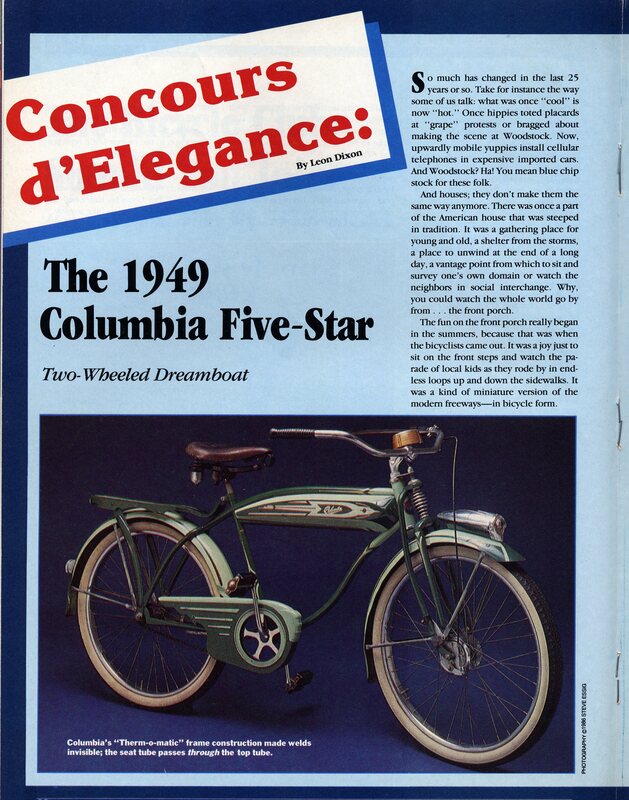 It was intended to be a personal, historical, and nostalgic account of the Columbia Five-Star Superb Motobike (Columbia's catalogue name for the bicycle) bicycle. Aside from a previous article in CLASSIC BICYCLE & WHIZZER NEWS (also written by Dixon), this was the only factual treatise on the 1949 Five-Star history and the ONLY photos of a correct, original example published up until this time. All photos in the Cyclist magazine Concours 'd Elegance series for articles that were written by Leon Dixon were taken by our good friend and noted photographer, Steve Essig (there were subsequent brand-X articles that followed and used our Concours title, but these were neither written by us nor did we supply info for them). Although photo copyrights originally were listed in the magazine as Steve's they in fact are assigned to Leon Dixon as per agreement with Steve Essig. No part of this article or the original article may be sold, reproduced by any means or excerpted without written permission of the author. AUTHOR'S NOTE REGARDING THE COLUMBIA FIVE-STAR IN THE ACCOMPANYING PHOTOS. These are the original photos and text used in the 1986 article. This particular Five-Star belongs to the author and is totally original right down to the tires. There are absolutely no reproduction parts on this bicycle and all chrome is original. Likewise, the seat, grips and decals are all original. Paint has not been altered nor touched up in any way. 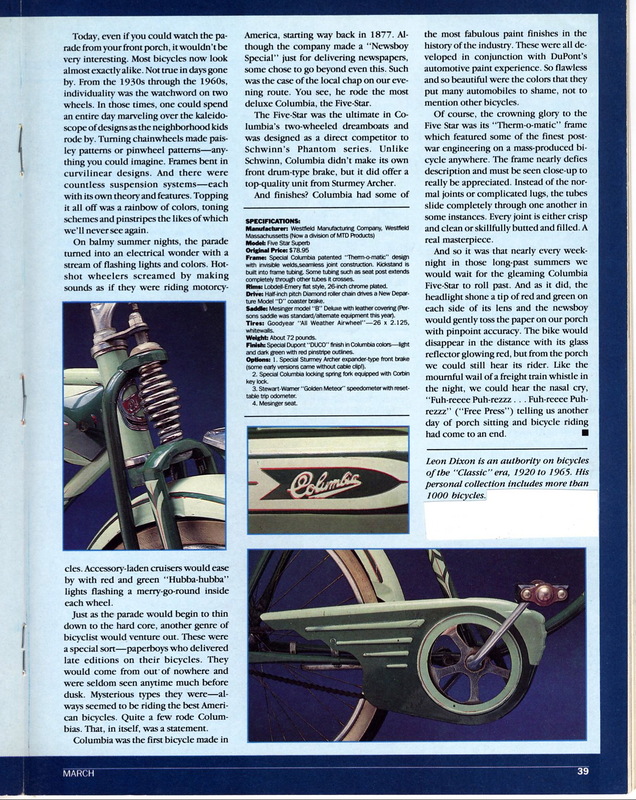 More on this in our upcoming book on classic bicycles. Thank you for visiting the NBHAA Historical Articles! This section will change as time goes on, but will continuously feature rare glimpses at bicycle history, memorabilia and facts you won't find anywhere else. We will eventually be posting the entire series of CYCLIST magazine articles that were written by your curator in the 1980s. We hope you enjoy the photos and information. And stay tuned ! This page, all design and contents, all photos unless otherwise noted are Copyright (c) 1985. 1999, 2005, 2011, 2013 by Leon Dixon/NBHAA, All rights reserved.